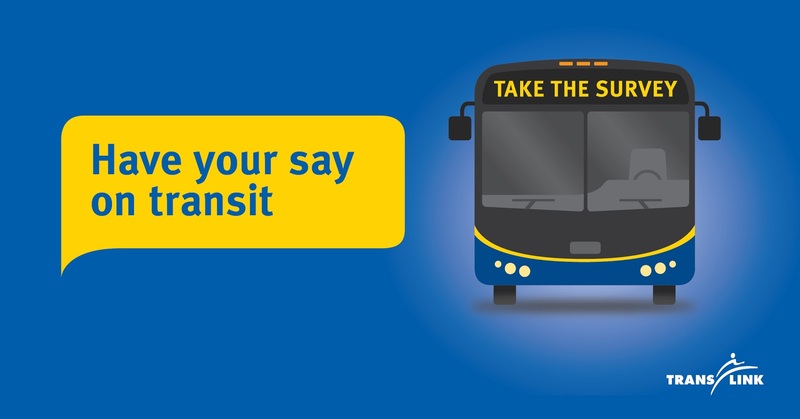 Douglas College students are invited to take part in an online TransLink survey focusing on more than 85 proposed transit changes. The survey is available until Nov. 6 and features questions on proposed changes aiming to improve your experience as a rider. The changes that could most affect Douglas College students are the Burnaby/New Westminster Package, which includes changes to Community Shuttle Buses, re-routing buses and introducing a new bus-only left-turn signal on Cumberland Street, and the Metrotown – Edmonds – New Westminster package, which suggests splitting the route into two services at Edmonds station, redesigning the route and introducing the New K line. Other proposed changes that could affect students are featured in the Northeast Sector: Millennium Line – Evergreen Extension, which would see the Millennium line connecting Coquitlam to Vancouver, via Port Moody and Burnaby, as well as six new stations added to the network at Lafarge Lake-Douglas, Lincoln, Coquitlam Central, Inlet Centre, Moody Centre and Burquitlam. The Port Moody – North Coquitlam Package would introduce a series of new buses, re-routing and the discontinuation of the 178, C27 and C28, while the The Northeast Coquitlam – Port Coquitlam Package proposes a redesign of the C37 and C38 and the extension of the C40 from Port Coquitlam Centre to Coquitlam Central Station. Douglas College students will explore the complexities surrounding love and loss in the production of Almost, Maine. Running from Nov. 5-13, the critically-acclaimed play, written by award-winning actor and playwright John Cariani, is comprised of a series of stories focusing on love and loss in the tiny, remote town of Almost, Maine. 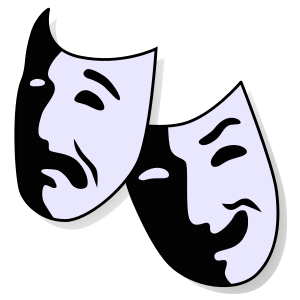 The College production – presented jointly by the departments of Theatre and Stagecraft and Event Technology – will showcase six of the 11 scenes. “It’s about the tiny magic moments in life, the zing between people, where something just might occur – that’s the ‘almost’ of Almost, Maine. The characters experience these spark-and-crackle moments when things shift and spaces open between two people,” director Deborah Neville says. The backdrop to the unusual love stories is the beautiful lights of the aurora borealis, which is weaved into stories throughout the play. “None of the stories share what’s to come next – they’re about the match-strike moments – that’s the focus. And the aurora borealis is almost like a character by itself,” Neville says. The cast of Douglas students includes Surrey resident Jamie Armstrong as East and Waitress, Vancouver resident Sean Brown as Randy and Jimmy, Burnaby resident Nina Dosdall as Glory and Rhonda, Langley resident Logan Tower as Pete and Chad, White Rock resident Jace Byers as Dave and Lendall, and South Surrey resident Rachel Fournier as Ginette and Sandrine. Almost, Maine runs Nov. 5-13 at the Douglas College Studio Theatre at the New Westminster campus, 700 Royal Ave.
A networking event with 12 professionals from the Criminology sector. In small groups, students will have an opportunity to meet and learn from these experts. The event has limited seating. To register, visit DouglasCollegeSEC.ca or call 604-527-5889. Come and learn what you can do with an AA in Intercultural and International Studies! Meet successful graduates, engaging faculty members, and eat some free pizza. This session is a Q&A format with five representatives from various areas of the Criminology sector sharing information on their careers as well as some lessons learned through working in the field. Seating is limited. Register at DouglascollegeSEC.ca or by calling 604-527-5889. 7pmHelp raise money for literacy in Uganda and at home at the 5th annual Uganda Project Quiz Night, co-hosted by Douglas College Foundation and Coquitlam Sunrise Rotary, MC'd by Coquitlam Mayor Richard Stewart. Snacks, cash bar, silent auction, draws and more. Entry fee $20 per person. Register online at douglascollege.ca/community. Note: Because of the cash bar, no one younger than 19 can attend. Meet with perspective employers, get some insight on working in the field, expand your personal network and gain valuable interview experience. Are you interested in working in financial services? Or simply looking for something to major in? Join the Douglas College Business Association as we host the CFP information session. The designation is an internationally recognized and important stepping stone to a career in the Finance industry. A representative from the designation will be attending. 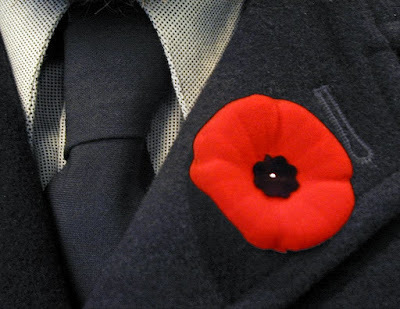 On Nov. 11, people across Canada will pay their respects to the members of the armed forces who served this country. To mark the occasion, Douglas College will hold a Remembrance Day poetry competition. The contest is open to all students enrolled at Douglas. The top-three submissions will each receive a prize. The first-place winner will receive a $300 tuition credit, while the second- and third-place winners will receive a $150 and $100 Bookstore voucher, respectively. We will accept original and unpublished poems in English, on the themes of war, peace, and remembrance. Poems should be typed and no longer than 30 lines. Include name, student number, email and telephone number on a separate title page paper-clipped to your poem. Only your student number should appear on the poem itself. 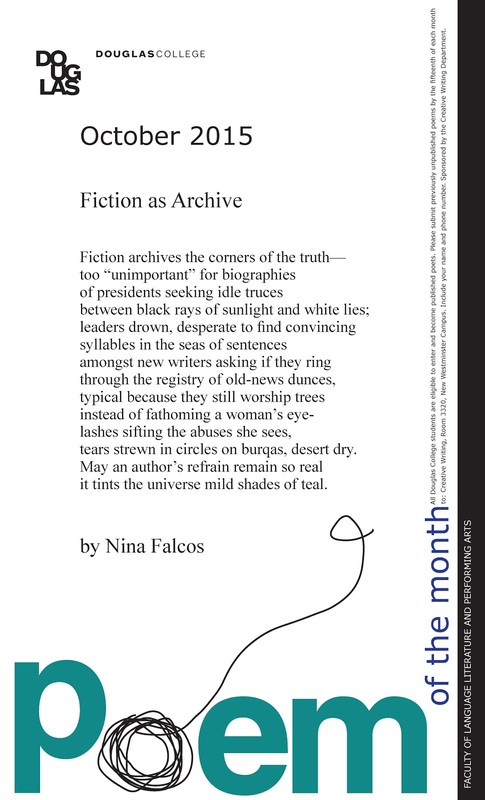 The deadline for submission is Nov. 5, 2015. Submit your poem to the drop box in the LLPA office, or by email to Leah Hjalte. Judging will be done by instructors from the Creative Writing Department. Winners will be announced on Remembrance Day, Nov. 11, 2015. Winning entries may appear on the Doug Blog. A Douglas College Geography lab technician has sparked the attention of fellow geographers after co-authoring an article refuting popular beliefs on global warming. Tyler Herrington and his co-author, Kirsten Zickfeld, have published a piece arguing that carbon emission-reduction policies will not only benefit future generations, but also those who implement them. “It’s a widely held misconception that the main effects of CO2 emissions will not be felt for several decades to centuries after emission. I was taught that myself when I was an undergrad,” Herrington said. In their article – published on Environmental Research Letters in March – Herrington and Zickfeld respond to a 2014 letter written by Ricke and Caledeira that estimates the median time lag between a carbon dioxide emission and the maximum-warming response is a decade on average. Upon reading the letter, something clicked for Herrington. Zickfeld – who was Herrington’s Master’s supervisor at Simon Fraser University - had been invited to write an article on the subject and asked Herrington to be a co-author. 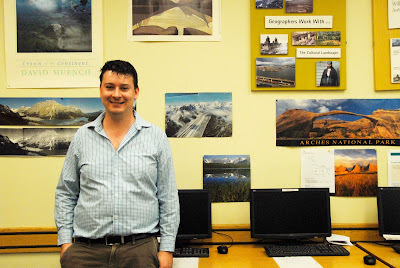 The SFU Geography grad had focused on a similar subject matter for his Master’s thesis, which was also featured on Earth System Dynamics, the online journal of the European Geoscience Union. Herrington, who is considering pursuing a PhD, is now focusing on educating people on the findings of the research. While he notes that the article on Earth System Dynamics is quite technical and better suited to a climate-science audience, the findings co-authored with Zickfeld, he said, are important to everyone. “The realization that the implementation of emission-reduction policies will have benefits in the near-term - and not only in the long-term - may make the idea of emission reductions more palatable,” he said, adding that he may try to build some of his findings into future lectures or discussions with students in climate-related courses. Herrington is also considering research on climate adaptation to complement his background in climate science. Find out more about the Zambia Global Leadership Program at an information session. Register online. Find out more about earning a full college credit while studying in Wales. A reading by author Hiromi Goto sponsored by the Department of Creative Writing and the Canada Council for the Arts. Free and open to the public. Find out more here. Join Arts at One Oct. 22 as the Music Technologies Certificate program presents a performance by its students. Directed by Blair Fisher and Robert Caldwell. Free and open to the public. The Douglas College Environmental Science student grew up spending every Sunday in her hometown of Campbell River with her parents scouring for fossils, exploring back roads or spending time with their many pets – including dogs, birds and reptiles. Now, Wilson is looking to make a career out of her love of science, animals and the outdoors. The fourth-year Douglas College student started out as a General Studies student before transferring into Environmental Sciences after two years – a decision many people who know Wilson supported, including her Grade 12 biology teacher. After returning to Campbell River for the summer to volunteer and gain work experience, Wilson received an email from her high school teacher letting her know he had nominated her for the Tom Easton Remembrance Bursary, which she won and is now using towards her last semester at Douglas. “It was nice to know that I had made an impact on my teacher so much that he thought of me,” Wilson said. Wilson credits Douglas College’s small class sizes, engaging teachers and general sense of community for the academic success she has enjoyed, noting that a big university didn’t have the same appeal. An avid surfer, Wilson, who plays volleyball with the Royals, plans to take time off to travel to the South American coastline with her brother. Once she returns to Canada, she is confident she will continue the career path that she started – albeit unknowingly - so many years ago. “This whole journey was trial and error and learning as I went along. Without the support of instructors, teachers back home and my parents this wouldn’t have been possible,” she said. “It’s OK to try something and fail at it – you move on or you try again. 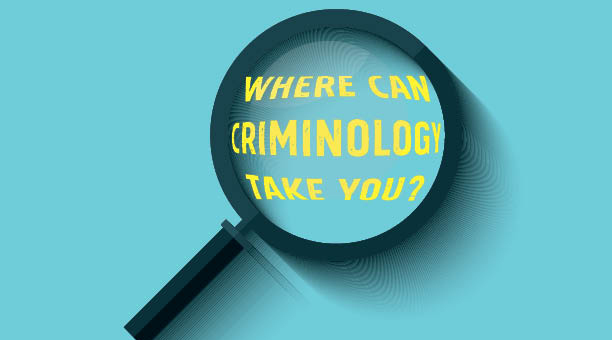 Interested in a career in Criminology? Douglas College will host three events this month that will provide insight and networking opportunities into the rewarding field of work. Kicking off the series will be a career café on Oct. 27, 1-3pm, in the Douglas Room (Room 1200) at the New Westminster campus. The ‘speed networking’ event will feature 12 professionals representing various areas of the Criminology sector. In small groups, students will have the opportunity to meet and learn from experts in the field. Seating is limited. In the evening, the Coquitlam Campus will be the venue for an employer discussion panel from 6-7:30 pm in Room B3011. This session will follow a question-and-answer format with five panelists representing different areas of the Criminology sector sharing information on their careers and lessons they have learned. Seating is also limited for this event. Wrapping up the two-day information series will be an opportunity to meet prospective employers on Oct. 28, 10am-4pm at the New Westminster campus’ concourse. The event will include opportunities to speak to prospective employers one-on-one, talk to representatives in the field, gain valuable interview experience, and find out about available jobs and submit your resume. The event – hosted by the Criminology Department, Student Employment Centre and Alumni Association – will also provide a valuable opportunity to develop and build a network of contacts. The Aram Bajakian Trio bring their punk-tinged jazz to Douglas College. Free and open to the public. Douglas College will host an Elections Fair Oct. 15 at the New Westminster campus concourse. The fair – which is open to the public – will provide information about the four major political parties and their platforms. The event is set from 11am-3pm and will be followed by a candidates’ forum, which will be held in the Douglas College Student Union lounge. The forum will be a dialogue, providing students with the opportunity to ask candidates questions and discuss their unique issues. 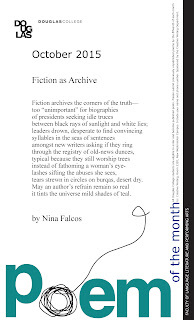 Click on the image to the right to see an enlarged version of this month’s poster, featuring "Fiction as Archive" by Nina Falcos. For Ken Werner, it took a big loss to make him realize he needed a change. After losing his mother to cancer, Werner decided to pursue his passion by enrolling in Douglas College’s Veterinary Office and Animal Care (VOAC) certificate program. “I realized life was too short. So I decided to quit my job, go back to school and follow what has always made me happiest – animal welfare,” he said. VOAC graduates are at the front line at animal clinics, performing duties that range from booking appointments to working in the laboratory. The program also provides core skills applicable to various positions in the industry. Werner had no problem finding work in the field after graduating from the program in 2012. He spent time working at a large practice and clinics before deciding to explore other career paths, leading him to his current position as Territory Manager for Petsecure Pet Insurance. 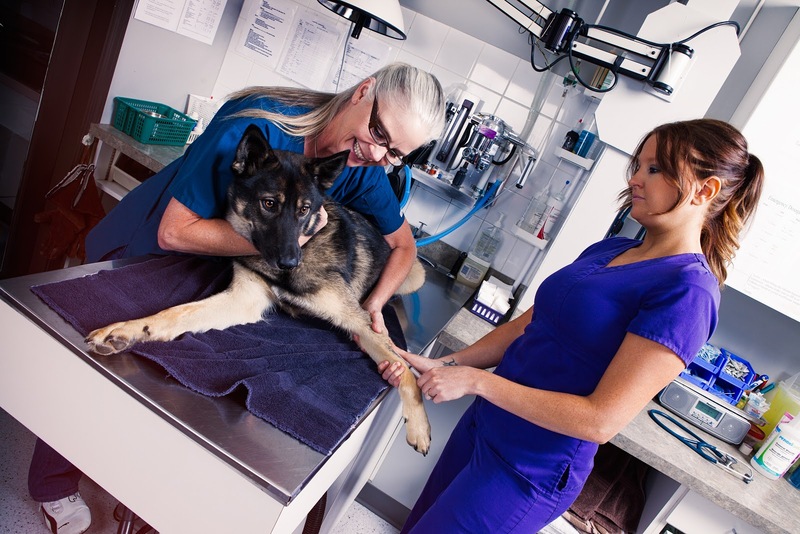 Werner notes that the program provides the fundamentals in animal restraint, nutrition, anatomy and customer and patient care – all valuable skills. The VOAC certificate program prepares students for the multifaceted duties of veterinary assistants with hands-on training and real-world assignments. Like Werner, many graduates find a job in their industry within months – including Velleda Lacayo. The Douglas grad completed the program in August and is preparing to start work at Boundary Bay Veterinary Specialty Hospital. She credits the passionate instructors who “clearly love what they are doing” and her hands-on training during her practicum for preparing her for her new career. Animal lovers looking to turn their passion into an exciting career are invited to Douglas College Oct. 22 to learn more about the Veterinary Office and Animal Care certificate program. 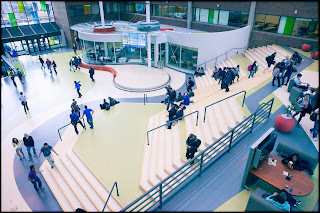 The hour-long information session is scheduled for 6pm at the New Westminster Campus and will feature a presentation followed by a question-and-answer period. To register, call 604-527-5472 and quote Course Registration Number 31255. Information sessions are also slated for Nov. 19 at 6pm. and Dec. 10 at 6pm. A Douglas College Psychology professor and grad have given coffee aficionados another reason to reach for a morning cup of Joe. And the results are promising. Based on the studies conducted with Douglas College students, Vittoz and Efimoff believe people who ingest caffeine will make less risky choices when in a decision-making situation. “It can be surprising to some people,” Vittoz said. Efimoff - who landed a job at UBC researching men’s health programs in the Downtown Eastside after graduation – and Vittoz are focusing on sharing the findings of their caffeine study. Efimoff has already presented at a student conference in Bellingham, WA., while Vittoz will be travelling to Chicago in late November for the international Society for Judgment and Decision Making conference. Ultimately, the aim is to have their work shared in print. “With any luck, we could have something published in a year,” Vittoz said. Efimoff and fellow grad Sara Saeedi approached Vittoz with ideas on their honours research project – a part of the Bachelor of Arts in Applied Psychology degree program at Douglas College, which gives students the chance to apply their knowledge prior to graduation. This is the first year the honours program has existed. While Efimoff wanted to focus on caffeine - after learning about stimulant drugs in the course Drugs and Behaviour, taught by Vittoz - Saeedi, who also holds a kinesiology degree, wanted to further research a study suggesting high-intensity exercise could lead to optimal decision making. Knowing that with people with disorders such as Attention Deficit Hyperactive Disorder use stimulant drugs to focus, and referencing literature that noted drugs similar to amphetamines can help people with delayed discounting – where an immediate award is denied to gain a larger reward in the future – the duo began to work on their theory. With more than 100 Douglas College students as their volunteers, two tasks were administered. Of the two, only one task was effected by caffeine. Study subjects had four decks of cards put in front of them and were told to select a card from any of the decks and to repeat this process 100 times. After they had selected their card, they were given feedback and would either win or lose money. Those who gamble with a risky deck experienced big wins, but also big losses, while those who choose the more conservative desks come out ahead in the long-run. Following the completion of the study, Vittoz and Efimoff realized that subjects who had caffeine pills pick up on the identity of the safer deck and stick with those decks, as opposed to those on placebo, who take longer to deduce which deck is safe and continue to experiment with the other options. “You can speculate that caffeine is helping them pay attention and retain their memory, or maybe it’s helping them to reduce their impulsivity,” Vittoz said. Saeedi’s study proved to be more difficult to track, as subjects were required to exercise at intense levels. Based at the gym, two personal trainers stepped into the role as experimenter and research assistant and helped push the participants to achieve the high-intensity level needed. Despite their efforts, there were no clear results found with the study. Vittoz added that the blood glucose increases occurred in only half the participants who engaged in high-intensity exercise. This resulted in a sample that was too small to establish a statistically reliable trend. “Unfortunately in this case, we couldn’t make any strong conclusions, but we think there is a strong future for this research. It’s something we could potentially pursue,” she said. Later this month, in an effort to prepare for a potential earthquake, Douglas College students, employees and visitors, along with thousands of other British Columbians, will participate in the Great British Columbia ShakeOut. 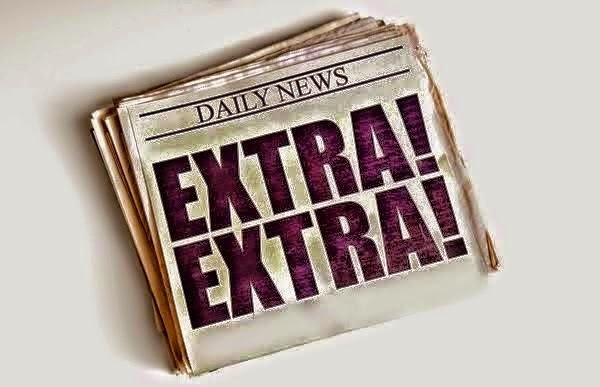 Around 10:18am on Thursday, Oct. 15, at the New Westminster and Coquitlam campuses, a public announcement will be broadcast advising we are about to start the Great British Columbia ShakeOut earthquake drill. When you are advised that the drill is starting, carefully drop to the ground, take cover under a desk or table and hold on. If you are not near a desk or table, or are physically unable to drop, cover and hold on, then cover your head and neck with your arms and crouch in a corner, away from any glass. Meet the teachers and find out more about the 2016 Douglas College Maritime Field School. Featuring Arthur Steele, violin, Natalie Mackie, viola de gamba, and Konstantin Bozhinov, lute. Free and open to the public. A 55-minute mult-media show designed to educate and inspire future vet techs. All are welcome to attend. Tickets are $10 plus fees. Buy tickets here. On the ice, Brianna Delmaestro brims with confidence. But when it comes to her education, the gold-medal figure skater is less certain. “I’m not quite sure what I want to do,” she says. That’s why taking General Studies is a perfect fit. There’s no pressure to pick a major or program. Instead, Brianna can choose the courses she wants in the humanities, sciences, social sciences, performing arts and business based on her individual goals and interests, while earning credits that can lead to a diploma or transfer to university. In her first semester, she took a course on nutrition, which has inspired her to possibly study dietetics at UBC. "As an athlete, I have a passion for nutrition and healthy eating. I would love to study the area further and maybe pursue it as a career," she says.